Trim the flank steak of any large pieces of membrane. Cut the flank in half or thirds lengthwise, or with the grain. Depending on the total width of the flank, you may get two or three sections that are about 2½ inches wide. Cut these sections against the grain into ⅛-inch slices. Put the sliced beef in a medium bowl. Add 1 tablespoon plus 1 teaspoon of the soy sauce and mix well. Add the cornstarch and mix well again. Set aside. Preheat a wok over high heat until wisps of smoke rise from the surface. Add 1 tablespoon of the oil and heat until it starts to shimmer. Gently add the beef in a single layer. 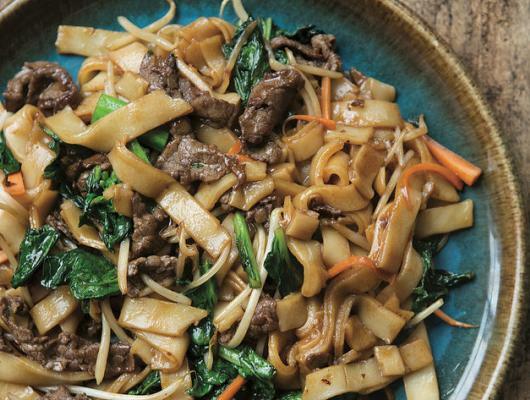 Sear for about 1 minute, then stir-fry the beef, breaking up any pieces that have stuck together. Remove the pan from the heat and transfer the beef to a medium bowl. Rinse the wok and dry with a towel. Separate the noodles and set aside. Return the wok to the stove and heat over high heat until wisps of smoke rise from the surface. Add the remaining 1 tablespoon oil and heat until it starts to shimmer. 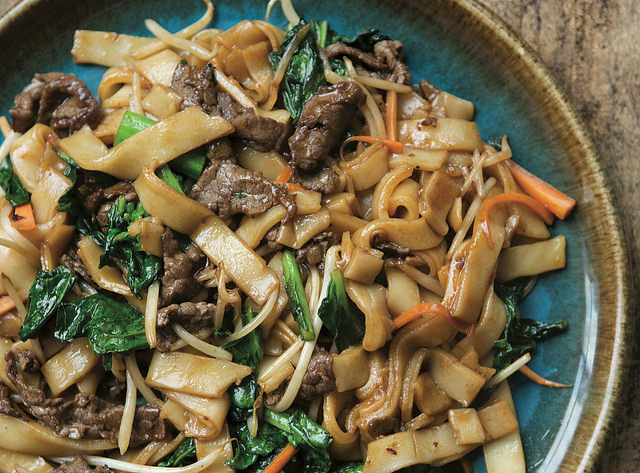 Add the gai lan, carrots, and bean sprouts, and stir-fry for 1 minute, or until soft. Add the water, the remaining 2 tablespoons soy sauce, and the hoisin, and stir to combine. Add salt to taste. (The sauce needs to be slightly over seasoned to accommodate the noodles.) Add the noodles and stir-fry gently, but quickly and thoroughly, until all the noodles have been coated with sauce, about 2 to 3 minutes. Serve immediately.